Patients commonly complain of asthenopia, but until now, there was no easy or reliable way to test for dynamic accommodative lag. With the new Speedy i/k,accommodative accuracy is measured with a novel methodology that allows you to understand the source of your patient symptoms, as well as quantitatively adjust your prescription. - Employs accommodative micro fluctuation with high pass frequency 1-23 Hz. 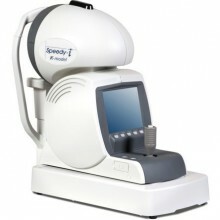 Click the button below to add the Right Medical Speedy i K Model Keratometer to your wish list.